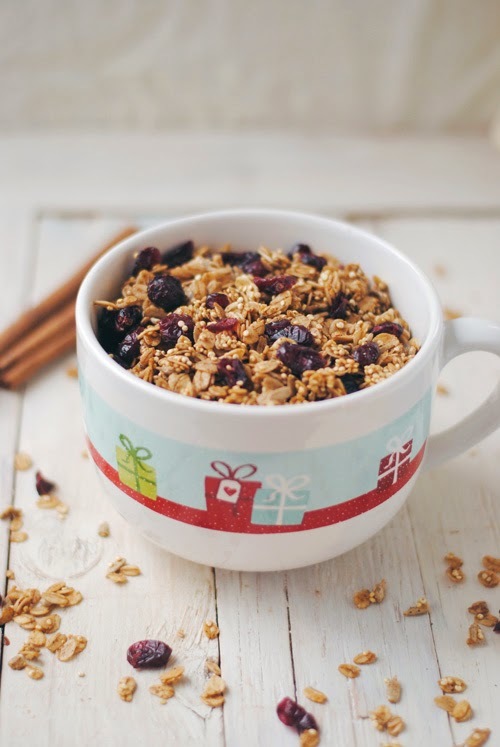 This holiday spice granola is perfect for frosty winter mornings. Or gift giving. Or making just to have the aroma of cinnamon and ginger fill your home to welcome the holidays at last. I love a warm bowl of oatmeal in the morning, but on rushed days (or lazy days) nothing beats granola. Hearty, healthy, and totally filling, it's perfect on the go or in the bowl. This holiday spice version kicks everything up a notch with the perfect hint of gingerbread and sour-sweet dried cranberries. My version is nut-free, but you can always toss in some almonds or whatever else you nut-eaters like. Whatever you do, just make it, because it tastes like holiday magic and we all need that in our lives. Trust. Preheat oven to 300F and line a baking sheet with parchment. In a large bowl, combine the oats, quinoa, seeds, syrup, oil, vanilla, and spices (everything except the cranberries). Stir until well combined. Spread the granola evenly on the sheet, and bake for 15-25 minutes, until lightly toasted. Sprinkle with dried cranberries and store covered in a cool, dry place.